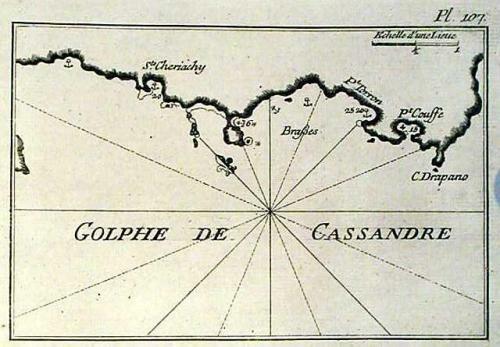 This sea chart (printed on thick paper for use at sea) shows the eastern coast of the gulf of Cassandra. The gulf of Cassandra is a body of water which separates the two western-most fingers on the peninsula of Khalkidike in the district of Makedon and connects with the northern Aegean Sea. The chart shows depth soundings and anchorage points.